This Fling has found its way into VMware Cloud on AWS. It was released as an official tool ‘Content Onboarding Assistant’ which clients can download and use with the VMC. vSphere Content Library is a feature that was introduced with vSphere 6.0. It provides a simple and effective way of managing content, such as VM templates, vApps, ISO images, and others files. Content Library can also distribute this content across sites and vCenter Servers. 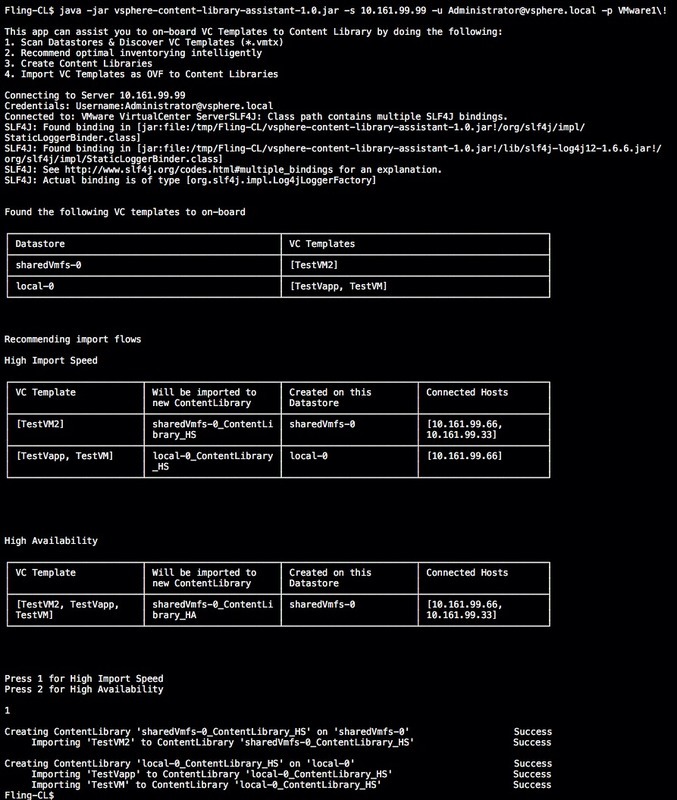 Let us introduce vSphere Content Library Assistant. The Assistant will help you easily on-board your VC templates (.vmtx) on to Content Library. Please note that Content Library operates with OVF templates but not with VC templates. Download the vsphere-content-library-assistant.zip file and extract it to a specific folder. If using Windows, verify your Windows environment setting for JAVA_HOME. Open your standard Terminal application and go to the above folder. Run Java command: $java -jar vsphere-content-library-assistant-1.0.jar to display the list of available command line options and also example usage. Run the above command with appropriate command line options. vSphere Content Library Assistant is interactive and will prompt for user response whenever necessary.